Yesterday, we told you about a one-off Ferrari 430 being auctioned off for Abruzzo earthquake relief, and today we have another special European car that is set to hit the block for a good cause. BMW has just unveiled a special George Harrison Mini Cooper that will be up for bidding, with the proceeds set to go to Harrison's own Material World Charitable Foundation, an organization dedicated "the exploration of alternate and diverse forms of artistic expression, life views and philosophies as well as a way to support established charities and people with special needs." The psychedelic hatchback is actually an homage to George Harrison's "extravagant original" Mini Cooper S, a customized car that was given to the late Beatle by his manager, Brian Epstein back in 1966 (the other members of the Fab Four got one too). The original Harrison Cooper actually starred in the Beatles' Magical Mystery Tour movie, and the new one has been designed with the input of Olivia Harrison, George's wife. The keys to the new Cooper will be handed over to Olivia on behalf of the MWCF at MINI United, a three-day festival held in Silverstone from May 22 through 24. Official press release after the jump. 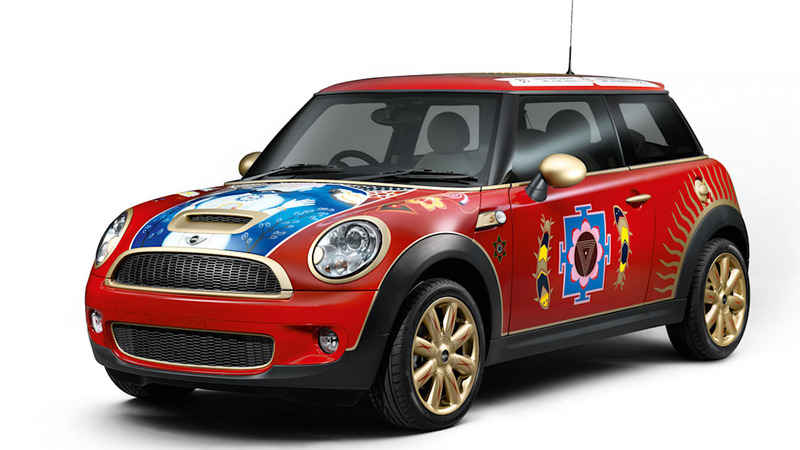 New edition of the legendary George Harrison MINI helps support a good cause. Munich/Silverstone. MINI has come up with a fresh interpretation of George Harrison's extravagant original Mini to coincide with the brand's 50th birthday. The one-off model will be handed over to Olivia Harrison at the MINI United event. Olivia will accept the MINI on behalf of the Material World Charitable Foundation, a charity set up by George Harrison in 1973. The car will be auctioned in aid of the Foundation later in the year. MINI United – the world's biggest fan event – will take place at Silverstone in the UK on 22 – 24 May 2009. The festival delivers three days of non-stop entertainment for the brand's large fan community. 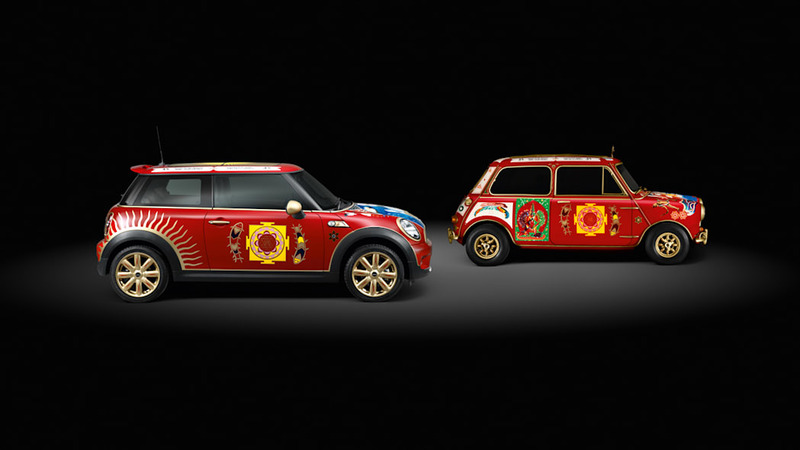 MINI United is all about concerts, shows, car races etc., and provides the perfect stage on which to showcase the unique new MINI inspired by George Harrison. George's psychedelic MINI in a new look. Back in 1966 The Beatles' manager Brian Epstein gave each of the Fab Four a Mini Cooper S as a gift. 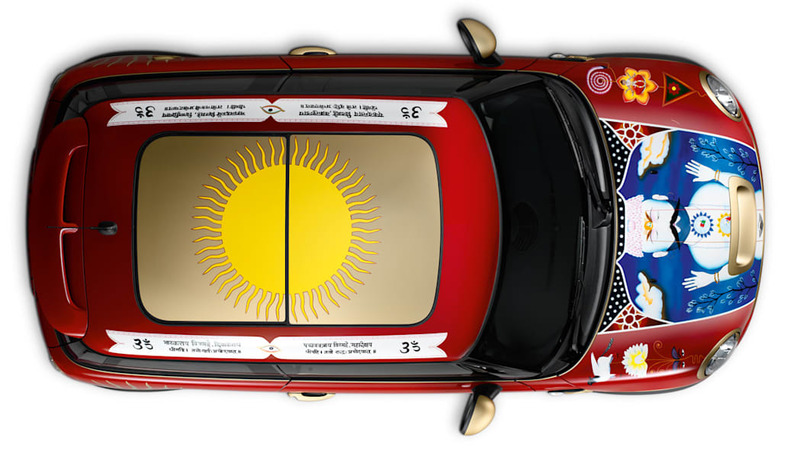 In keeping with the zeitgeist of the time, lead guitarist George had his car painted with psychedelic images such as yantras and Sanskrit mantras. In 1967 this legendary Mini starred in The Beatles' film Magical Mystery Tour. And now, to coincide with its latest landmark anniversary, MINI is dedicating a modern interpretation of George's car to the man himself. The MINI has been designed according to the wishes of Olivia Harrison and rekindles the look of George's famous original. "George was a huge MINI fan and he would have enjoyed creating this new version. The fact that MINI's anniversary celebrations will also benefit our Foundation has made it an enjoyable as well as meaningful collaboration." says Olivia Harrison. Replay signs up as MINI United partner. The denim specialist congratulates MINI on its latest landmark birthday and presents an anniversary jeans model, which will be available exclusively and in a limited edition from the Replay stand at the MINI United event. To mark the anniversary, the used-look jeans sport a circular "50 Years of MINI" sew-on badge on the front left pocket. Added to which, all the MINI staff at the festival will be kitted out in Replay jeans. Selected Replay stores are promoting the event in special window displays.